Welshman Matthew Stevens gained some revenge over Shaun Murphy for his World Championship defeat last May with victory in the revived Pot Black Cup. Stevens, beaten 18-16 by Murphy at the Crucible last year, edged a 53-27 points victory in the one-frame event after an error on the yellow by Murphy. "Obviously I'd rather have beaten Shaun in the World Championship but this is a very special event to win," he said. Pot Black, first held in 1969, was revived after a 14-year absence. The event, first won by another Welshman Ray Reardon, was played in the grand surroundings of the RAC Club in Pall Mall. Murphy had looked hot from the start - beating Jimmy White in the first quarter-final with a break of 111, the highest in the history of the competition. John Higgins also looked on song, leaving Stephen Maguire without a pot in their quarter-final, to set up a meeting with Murphy. Higgins forged ahead with 49 but missed a red after using the rest and Murphy produced a tremendous clearance of 71 to the blue to reach the final. 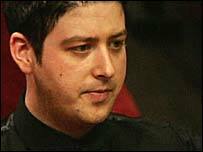 The world final re-run was confirmed when Stevens made a break of 65 to comfortably beat Paul Hunter - who had earlier disposed of Ronnie O'Sullivan on the black after a colours clearance.